american-milspec has no other items for sale. The Motorola line of radios are made for every day use in some of the most rugged environments. 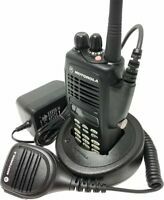 The XTS 3000 is a prime example, it has lasted the test of time for law enforcement to heavy industry where most other radios would just not last. When I went looking for a commercial quality radio I went directly to the Motorola line because I knew they would out live most other manufacturers. The XTS 3000 is a heavy bulky radio portable radio, but it delivers a rang of features such as narrow/wide band operations analog as well as digital and it even has encryption. The radio requires an external computer program that operates under Windows to set the features and frequencies you want to operate on. There is a rather steep learning curve to master the programming software but once you have an understanding it's easy to reprogram the radio. Because this model is no longer supported by Motorola the software is considered "end of life" so it is available on line for free. That being said you can still obtain parts and accessories for this model as it still has a larger after market uses. I bought it based on the idea I could use it for analog and digital communications and also have the more modern band width of 11.5 KHz instead of the old 25 KHz channel spacing. Being a rather large male I wanted a radio that I didn't have to worry about breaking the controls if I turned them a little harshly.